When writing my YA book Facing Up, I often played a compilation of Aretha Franklin hits. You wouldn’t think an African-American singer who began her amazing career in the ’60s would have much in common with a fictional contemporary Australian girl, but somehow it worked. I’d find I’d write faster and with more fire during certain songs, Respect being the most obvious! I suppose the common denominator was two young females battling to make sense of their lives. Aretha, despite her music success, came from a troubled family background and had her first child at 14. It’s a common thing to have music on in the background, for authors, artists, students, anyone working away on anything. But the tunes don’t have to have an obvious link with whatever is being created – it’s more about the emotions or passion behind the music, or even just having the music as white noise, especially when the words of songs on high rotation fade into the background. Music can certainly have an effect on what you’re doing – I find I drive far more faster listening to heavy rock (my long drives to college years ago were made shorter by Van Halen’s 51/50 album, Cold Chisel’s Chisel best-of, and a terribly corny early ’90s compilation that included some long-haired metal bands). Happily I drive far more slowly listening to classical music, apart from the odd moment of passion such as Mozart’s Requiem in D Minor or Beethoven’s Symphony No. 9, when the thunderous swelling of emotion in the Ode to Joy chorus* gets the better of me! A very talented young Aussie writer, Eliza Henry-Jones, has just released her debut novel, In The Quiet (Fourth Estate, 2015). Leading up to the launch of the book, she posted some songs on her official Facebook page which she listened to on repeat while writing it. It provides a beautiful background to the words, and is somewhat an insight into the author’s mood during the creation. It included this quietly stunning song by Sia, Breathe Me, that will now always remind me of this lovely, earthy book about grief and life and death and horses. An accompanying double CD was released, a fabulous idea to illustrate both the music and again, perhaps the author’s mindset while writing (if you didn’t know the type of music being referred to, the CD was the fastest way to understand it, to ‘hear’ the feelings of the characters). It’s sort of like a soundtrack to the author’s mind, an insight into the images unreeling themselves like a movie in their imagination as they write. This entry was posted in Writing and tagged Beethoven's Symphony No. 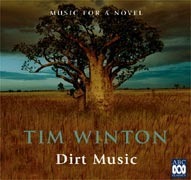 9, books with music, Dirt Music, Eliza Henry-Jones, imagination, In the Quiet, insight into writers' minds, Mozart's Requiem, Music, soundtracks, Tim Winton, writing and music. Bookmark the permalink.